That’s the theme of today’s must-make list. Sunny eggs and lemon in everything. 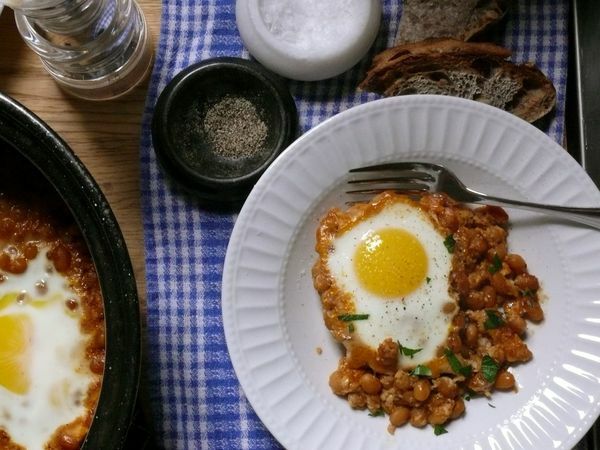 Eggs in tomato sauce, or shakshuka, is almost typical weekend fare in our house. But eggs poached in baked beans? It never crossed my mind until I saw someone else do it, and then it made all the sense in the world. James’ grandmother has a secret, unshared recipe for the best baked beans in the world, and I finally put his mom’s best approximation of the recipe to the test this weekend. When the beans were baked soft and sweet, I cracked 4 eggs into the them and they went back into the oven for just under 10 minutes. Then they got a little lift from a squeeze of lemon at the end. (I wonder if Grammie uses vinegar in her baked beans–at the end. Maybe cider vinegar?) Some crusty bread on the side and we had a new favourite Sunday brunch special on our hands. The other beans I’ve had my eye on are these black beans made with citrus, ancho chilies and chipotles. They look so good, all black, saucy and spiked with cilantro, and I can imagine them spooned over rice or scooped up with a fresh, soft tortilla. And since I’m the person at the table who always wants to order the lemon dessert over the chocolate one, I bookmarked this Meyer lemon pudding recipe as soon as I saw it. Definitely sounds like my kind of dessert. I love that they seem to require very little effort–that truly makes them my kind of dessert. So despite cold April showers (and some flurries this past weekend? Let’s not even discuss it…)that had me sitting in front of a fire and, frankly, scared to step outside, things are looking bright in my kitchen. At least. that sounds wonderful, shayma. we have an egg curry too but its done on the stove. is yours baked?